I was listening to my local public radio station while I was driving to work the other day. 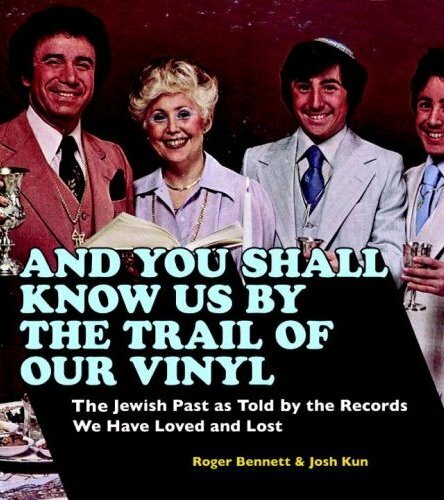 Roger Bennett, co-author of And You Shall Know Us By the Trail of Our Vinyl, was talking with Marco Werman about his attempt to save decades of American Jewish music from obscurity. We, at the JSA, are very proud of our participation in helping Roger and his co-auther, Josh Kun to find materials that eventually found its way into their wonderful book. The book is a wonderful compendium of stories, information, photos, and album covers from the 1950s, 1960s, and 1970s. Josh Kun, Associate Professor of communication and journalism at USC Annenberg School for Communication and the author of Audiotopia: Music, Race, and America, which won a 2006 American Book Award, co-authored the book with Roger Bennett who also co-authored Bar Mitzvah Disco. The authors write about how they “encountered the Judaica Sound Archives of Florida Atlantic University, where Nathan Tinanoff and his devoted staff generously opened their collection to us.” And where they found “thousands of LPs, shelf after shelf filled with dsicarded cardboard and vinyl that we gushed over like scientists marveling at new speciments” (p.17). Looking through the book is an education and a trip down memory lane. From Steisand to Bagels and Bongos by the Irving Fields Trio, from Molly Pecon to the Four Bursteins, from Neil Sedaka to Theodore Bikel, the names and images pop off the pages. The following JSA featured performers are highlighted in the book: Cantor Yossele Rosenblatt, Oysher-Michaels Family, Benny Bell , The 4 Bursteins, Gladys Gewirtz, Shimon & Ilana Gewirtz, Gadi Elon. A friend of mine who loves the book told me that when she goes on the JSA website it is like the “book comes to life” right on her computer. I can’t think of a nicer compliment.